I must admit, I have not seen many movies originating from Union, Missouri. To take that a step further, before the other night, I don’t think I’ve ever seen a movie originating from there. Now, I can say that I have. 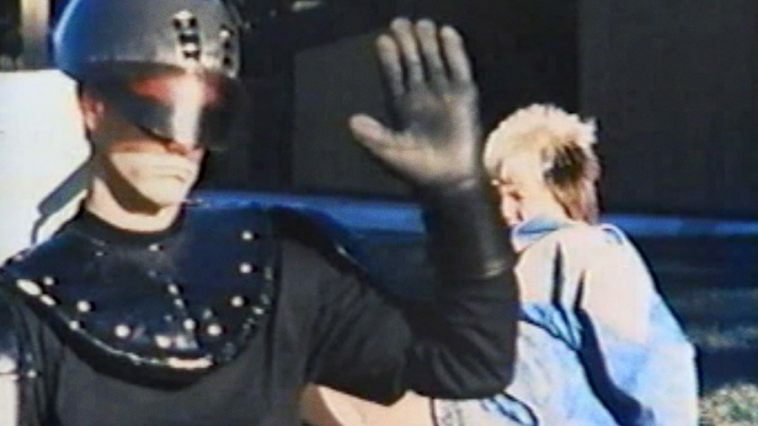 That movie is none other than The Skid Kid, a bizarre, super low budget superhero movie that really doesn’t make any sense and really isn’t all that good. The best I can say about it is that writer/director/producer Glen Gruner wanted to make a movie and he went and did it. Forget about how good or bad it is, he went and made a movie. The movie appears to have been shot at some point in the late 1980’s, based on the currently questionable fashion sense exhibited by the cast. 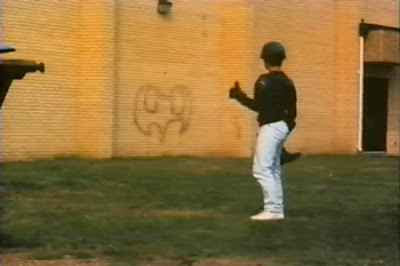 It was released on video in 1991 and was shot on Super8 film. It is a rather short film, clocking in at a mere 70 minutes, and its short runtime is padded out with extended sequences of kids at a skate park, a BMX bike race (which is great, watching everyone crash and get run over), and lots of sequences watching the title character do his signature skidding. Now, what is the movie about? I really don’t know. There really is not much plot or exposition to be found anywhere in this thing. 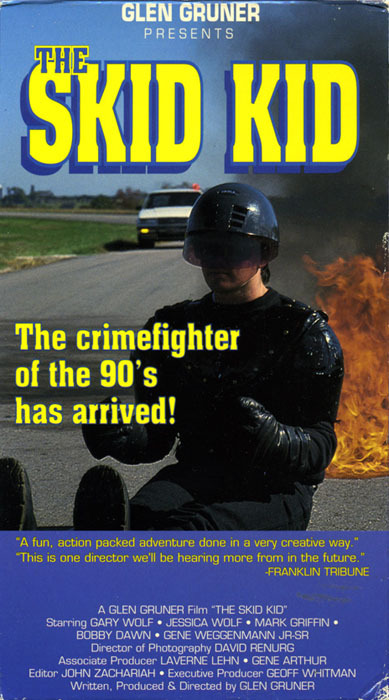 The Skid Kid is some sort of superhero who gets his power from boots, which get their fuel from, of all things, soda. He skids around sitting on the ground, like he is driving an invisible car. He shows up when bad guys are doing bad things and beats them up. Because of this, and an apparent high crime rate in the town, the FBI are looking for him. That is really all there is. There is no big showdown or real explanation of anything. The movie is in alternating moments hysterically ridiculous and absolutely tedious and a chore to sit through. Still, it is hard not to respect the guy for going out there and shooting a film, on film when video probably would have been cheaper, and getting it done. The acting is bad, the dialogue is even worse, and nothing makes sense. I am still glad I got to see it. It is the sort of small regional movie that was likely not expected to go anywhere. I wonder what Glen Gruner would think that people were watching his movie in a theater in a completely different state 25 years after its release.